Yash, who is gearing up for the release of KGF, and Prabhas were spotted together at an upscale hotel in Mumbai. What happens when two South Indian stars from different industries come face-to-face? We do not know about other actors, but in case of Yash and Prabhas, they apparently displayed their admiration and respect for each other. 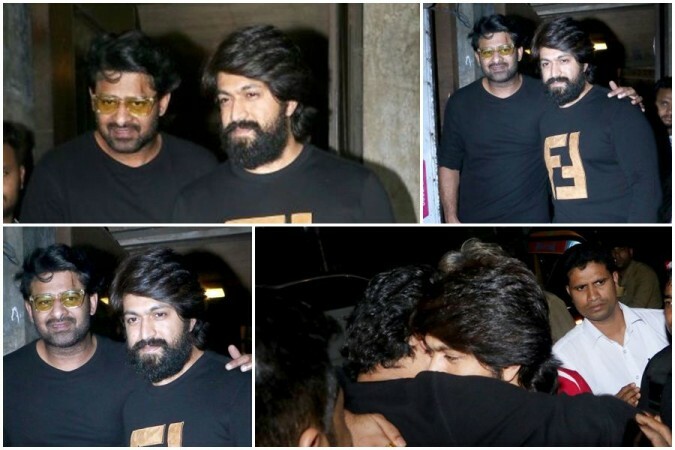 Prabhas, who came to national and international limelight with Baahubali series, was spotted with Rocking Star Yash in Mumbai on Friday, 8 December. They were seen together at Pali Bhavan in Mumbai. Reports coming from Mumbai say that it was not a planned meeting and they bumped into each other when they were having separate meetings. Apart from exchange pleasantries, they posed together for camera before bidding goodbye to each other with a big hug in public. Prabhas' popularity was restricted to South India until Baahubali series happened for him. Now, the actor, who is in Mumbai for the shooting of his next flick Saaho, has attained national and international fame. On the other side, Yash, whose market was limited to Sandalwood, is reaching out to the PAN Indian audience with KGF. With the trailers and promos, the Rocking Star of Sandalwood has raised a lot of hopes on winning the hearts of the audience across the nation like Prabhas did with Baahubali series. Indeed, Yash had recently admitted that the plans to dub KGF in Bollywood took birth after seeing the gigantic success of Baahubali series. KGF is period action thriller in which Yash plays the role named Rocky Bhai, a character with negative shade. Prashanth Neel-directorial talks about the rise of demand on gold in 70s, largely impacted due to global politics, and how it impacted the KGF, the pioneering gold mining town in Karnataka. The film releases in four languages – Kannada, Tamil, Telugu and Hindi – on 21 December.